While this quote may be more apt for spiders, we’ll use it here all the same – if that flies with you, of course. The deceptive strategies are due to a hodgepodge of chemical tactics to dupe ants and steer clear of their attack. Particular plants have a mutualistic association with ants and are generally well-protected from herbivore attacks by ants. However, larvae of the Oakblue butterflies survive and develop on specific plants, Macaranga, or the hosting ant-plant species and evade being ambushed by the ants residing on that plant. 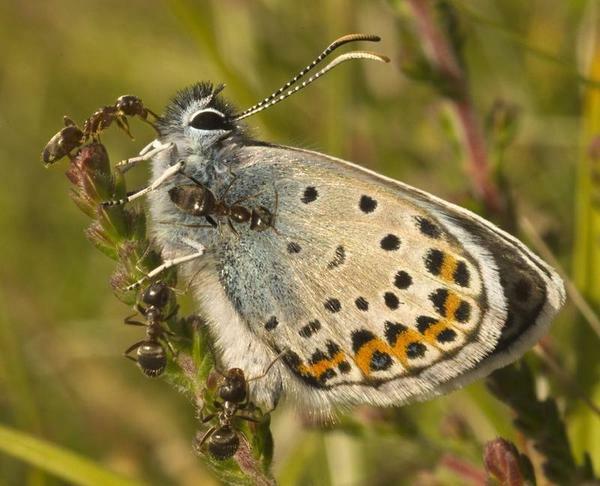 The authors of this study theorized that butterfly larvae may chemically camouflage themselves in order to be welcomed by the plant-ants on their host foliage, and hence would be shunned other plant-ant species living on plants which are not their regular host species. “Ant” it a bit confusing? I agree. To comprehend the whole process, let’s take a look at what the scientists did. They collected butterfly larvae for three Arhopala species native to Malaysia, followed by examining both the behavioral and chemical responses of the plant-ant species to the exploratory introduction of butterfly larvae along with fake larvae treated with cuticular hydrocarbon extract (chemicals that play an important role in insect communication), to the leaves of the Macaranga species. So what do these experiments ultimately reveal? Just this: that despite the fact that the reactions of the plant-ants to the butterfly larvae varied considerably (reactions which proved contingent upon the species of the butterfly) assailment on the normal plant host were rare. In chemist- or lepidopderist-language, of the three butterfly variations, A. dajagaka matched well with the host plant-ants, A amphimuta did not match, and A. zylda lacked hydrocarbons. Behaviorally, both the larvae and dummies coated with the cuticular chemicals of A. dajagaka were well attended by both host and non-host plants while A. amphimuta were often blitzed by host and non-host plant-ants, and all ants turned a blind eye to the A. zylda species. All-in-all, this study’s researchers hypothesize that variations exist in the chemical schemes deployed by gossamer-winged butterflies which ultimately allow them to evade ant ambushes and be welcomed by plant-ant colonies.